The hot-debated topic—cable management, is a critical part when planing a data center. Failure in cable management will expose cable to high fatigue rates, hinder people to identify cables or even bring difficulties when expanding or upgrading equipment. To meet the management needs, tools like patch panel, cable managers, and cable rings are brought in to life. Cable manager, the subject of the article, comes in varied types, among which I’d like to introduce the upgraded one—1U brush strip horizontal cable manager designed for server racks. The patch panel is partly a cable manager, but it also has other functions. With the brush strip horizontal cable manager, the cable management can be perfectly maintained. The new cable manager is made of refined metal and comes in different heights like 1U and 2U. Compared with original 1U plastic single sided horizontal cable manager with finger duct, it is a flat panel greatly saving the steel. The panel is designed to be mounted on any 19in EIA style rack or cabinet and features built-in brush that allows passage of up to 25 cables while blocking airflow. What Are the Advantages of the New Type of Cable Manager? 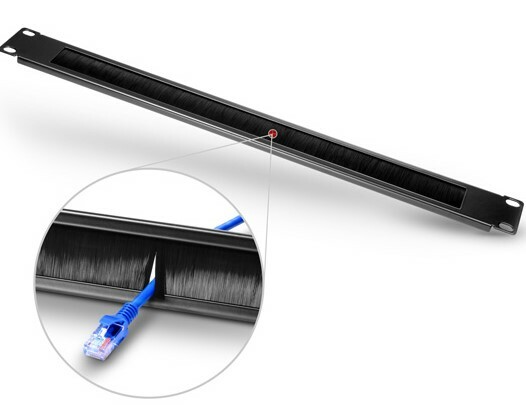 Compared with ordinary cable manager with a certain number of ports, the brush strip cable manager can allow for relatively flexible cable management, and the cables that come from or to patch panels is less likely to be rubbed when passing through the brush. What’s more, it can minimize the risk of unnecessary bending or subject cables to heat sources or sharp edges, thus enabling the cables to live longer. It comes with high-density nylon brush separating and organizing cables that increases overall air flow within your network cabinet while improves the efficiency of your cooling system by covering unused rack space. The sturdy steel structure and black powder coat finish fights presents durability, resists corrosion, and keeps your rack looking smooth and professional. Using four screws, it can be installed above or below the rack patch panel, and the two can coordinate seamlessly to present neat cabling. Just as the below video shows, brush strip panel is used to allow the passage of patch leads from the rear of the cabinet and then the patch cables are connected to the slots on the patch panel. They are installed within a data rack to neatly draw cables away from equipment. This type of management is typically slotted directly in front of equipment. The slots are masked with ‘brush’ strips which allow cables to pass through while presenting a tidy appearance and avoiding the cables dropping back into the rack. 1U brush strip horizontal cable manager can organize cables while keeping dust and dirt out of the rack. FS.COM produces a wide variety of cable management accessories specially designed for use in various cabinet and enclosure systems. These accessories include everything from vertical and horizontal cable managers, cable rings, and Ethernet patch panel to more easily route cables through the cabinet and preserve signal strength and data transmission. All these devices enable you to identify and track cables easily, while maintaining the freedom to remove or change cables with ease whenever necessary. FS.COM are always here for your suggestions and comments.